Eddy Packing of Yoakum, Texas, is recalling approximately 18,390 pounds of smoked sausage. 10-lb. 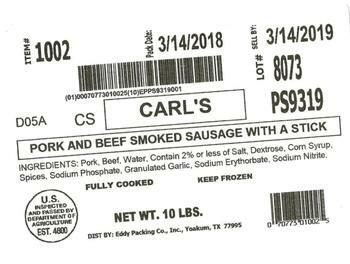 case of “CARL’S PORK AND BEEF SMOKED SAUSAGE WITH A STICK” with lot code 8073, case code PS9319 and sell by date of March 14, 2019. The recalled product, bearing establishment number “EST 4800” inside the USDA mark of inspection, was shipped to food service businesses in Texas. Consumers with questions about the recall may contact Francisco Montejano at 361-293-2361, Ext. 771.